Cambodia’s bustling capital is situated at the confluence of the Mekong, Bassac and Tonle Sap rivers. Legend has it that Phnom Penh was founded when a woman by the name of Penh found Buddha images washed up on the bank of the Mekong River. In 1373, a temple, Wat Phnom, was built on a hill to house them. With Phnom in Khmer meaning hill, Phnom Penh literally translates as Hill of Penh. Officially the city was founded in 1434 by King Ponhea Yat, following the fall of Angkor. Today, Phnom Penh is a city of more than 1.5 million people. 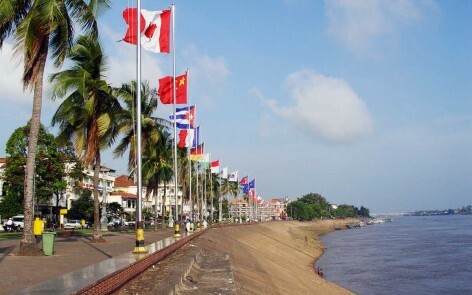 With continuing urban development it is fast developing into an economic hub of the region, at the same time retaining its distinct atmosphere with its wide tree-lined boulevards, French colonial buildings and an abundance of chic bistros dotted along the riverfront, bustling markets, intriguing boutiques and stylish hotels. Places of interest include the royal palace including the Silver Pagoda with its spectacular floor made up of 5,000 silver tiles, the National Museum housing treasures from the world’s finest collection of sculptures from the Angkor period, Wat Phnom, the city’s landmark and the notorious Toul Sleng Genocide Museum. 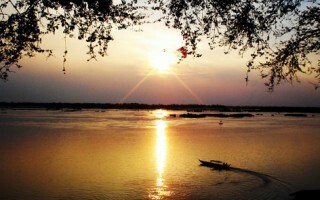 Phnom Penh is also ideal gateway for daytrips to the surrounding countryside. Particularly attractive are boat trips on the Mekong and Tonle Sap combined with a visit to the picturesque Silk Island or a visit of Udong, once the Capital of Cambodia, and the floating villages of Kampong Chhnang. 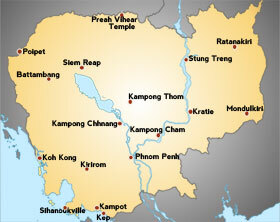 Kampong Cham is Cambodia’s most populous province and famous for its vast rubber plantations. For travellers the provincial capital mainly serves as stopover on the way to the Northeastern provinces. Attractions include Wat Nokor, an 11 century Buddhist shrine and the hills of Phnom Pro and Phnom Srei (man and woman hill) offering great views over the surrounding countryside. A visit of a rubber plantation is likewise an interesting activity. Situated midway between Phnom Penh and Siem Reap on the river Stung Sen, Kampong Thom is a relatively new tourist destination, serving primarily as a base for further excursions to the temple of Preah Vihear and Sambor Prei Kuk, the capital of Chenla during the 7th century. Other attractions include Phnom Santuk, a sacred hill affording spectacular views over the surrounding countryside and Santuk Silk Farm, which offers guided tours on silk production. As gateway to the temples of Angkor, Siem Reap is clearly the tourist hub of Cambodia. Accordingly, the town offers a vast array of accommodation options, ranging from boutique guest houses to some of the best hotels in the region. The picturesque town centre hosts many speciality restaurants, lively bars, designer boutiques and a bustling night market. Apart from temple visits, there are plenty activities that warrant a longer stay than just a couple of days, ranging from photography courses to cycling adventures to excursions to nearby bird sanctuaries or a homestay in a floating village on the nearby Tonle Sap Lake. The area around the provincial capital of Siem Reap is dotted with dozens of temple complexes, most of them situated in the Angkor Archaeological Park to the North of the town. 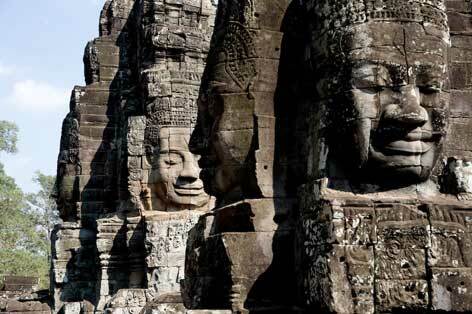 Among the countless treasures first-time visitors should at least include Angkor Wat, believed to be the world’s largest religious building, the Bayon with its mysterious face towers and the complexes of Agnkor Thom, a walled fortress which was once the centre world’s largest city. On the way to and back from these complexes visits of other temples are easily possible, above all of Ta Prohm which has been left to the forces of nature by archaeologists, many parts of its structure being embraced by the roots of gigantic trees. At least two days are required for a relatively detailed exploration of Angkor Archaeological Park which can be reached conveniently by car, tuk tuk or bicycle. The area is too large to be explored on foot. Battambang is Cambodia’s second largest town and is easily reached by boat from Siem Reap across the Tonle Sap Lake and up the River Sanker. 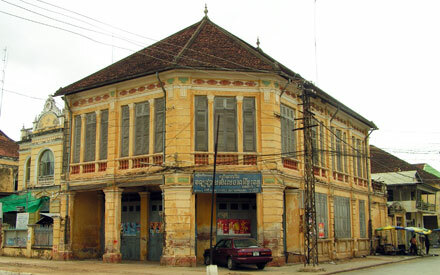 Battambang hosts much colonial architecture, giving the town a special atmosphere. As well as being one of Cambodia’s prime agricultural regions, the idyllic countryside around Battambang lends itself well for activities such as bamboo train rides or farm visits. Other attractions in the area include the Angkorian temple of Wat Banan, the sacred mountain of Phnom Sampeu and Wat Ek Phnom. The remote North Eastern province of Rattanakiri is the home of several ethnic minorities who still live according to their age old traditions. 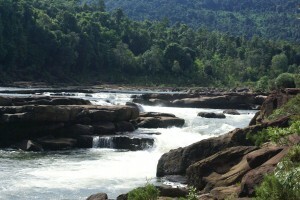 With its thick mountain jungles it is also home to much of Cambodia’s endangered wildlife. Centrally located, the provincial capital of Ban Lung is an ideal base for exploring the remoter parts of the province. One of the main points of interest is Yak Lom lake, a fresh water lake in a volcanic crater which makes a spectacular natural swimming pool. With its many rivers Rattanakiri is also ideal for jungle boat trips on the way to visiting secluded tribal communities, combined with a village homestay. Located at an elevation of approx. 700 metres, Mondulkiri is one of the remotest provinces and both climatically and culturally different from lowland Cambodia. Mondulkiri is also the home of minority groups, the largest of them being the the Pnong. There is an enormous wealth of wildlife found in the jungle covered hills as well a number of impressive waterfalls, Bou Sraa being the best known. With its relatively cool climate, Mondulkiri is ideal for trekking tours or jungle excursions on the back of an elephant. The picturesque town of Kratie (pronounced Krachay) is situated on the banks of the Mekong, which dictates every aspect of life in and around town. Kratie’s main attraction are the Irrawaddy Dolphins which live a few kilometres upriver and can be observed from small boats throughout the year. 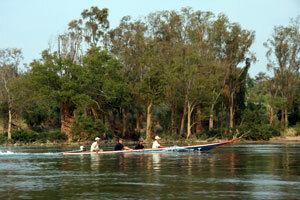 Kratie also offers many boating and cycling opportunities, for example on and around one of the idyllic Mekong islands. Another rewarding experience is a homestay with a Khmer family on one of the islands. 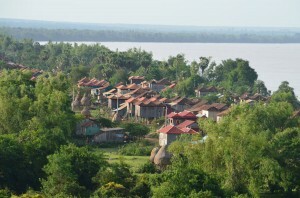 Stung Treng province is very thinly populated and most of it is still covered with forest. 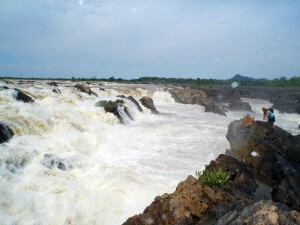 The scenic town of Stung Treng is situated at the junction of the Mekong and the Sekong and serves as gateway to some of the wildest and most spectacular riverscapes in the country. Accordingly there are many trekking, boating and biking possibilities. Also known as Kompong Som, the coastal town of Sihanoukville is Cambodia’s prime beach resort, situated approximately 230 km Southwest of Phnom Penh. In and around the town are many white sand beaches and off the coast a number of unspoilt, partly uninhabited islands. The tourist infrastructure is well developed and there is a vast choice of accommodation options, including some of the country’s best hotels. Dining options are abundant, many restaurants offering fresh sea food. Nevertheless, Sihanoukville is not as commercially developed as some of the crowded sea resorts in neighbouring countries. 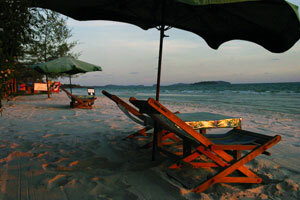 The sea around Sihanoukville is ideal for aquatic sports such as diving, sailing and fishing around the islands. Another rewarding destination is Ream National Park with its dense mangrove forests, secluded beaches and coral reefs and an abundance of wildlife. 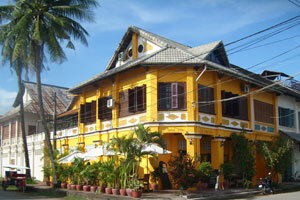 The sleepy riverside town of Kampot is rich in French colonial architecture, giving it a scenic atmosphere. It is an ideal base for various excursions to the nearby mountains, including Bokor Hill Station. 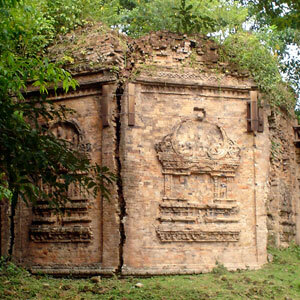 Of particular interest are also several cave pagodas and the many pepper plantations in the area. The fresh climate and soil type of Kampot as well as the experience from several generations of pepper farmers make this pepper unique. 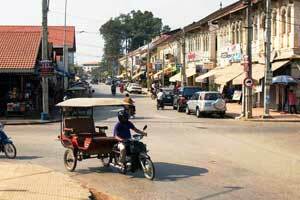 Kampot is an up and coming tourist destination and the city has recently undergone many changes. There are a number of charming hotels, guesthouses and resorts in and around town. The former seaside resort of Cambodia’s elite was almost completely destroyed by the Khmer Rouge, but has since been largely rebuilt and is enjoying increasing popularity. 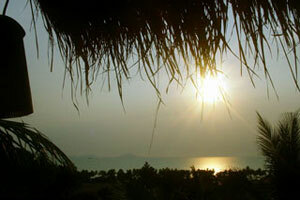 Surrounded by jungle-covered mountains, it offers stunning views and is justly famed for its scenic sunsets. There are many atmospheric boutique hotels and resorts offering quality accommodation and excellent food. Tasting the locally caught crab is a must for any visitor. Although Kep’s beach is not very attractive, nearby Rabbit Island offers a beautiful sandy beach and is only a short boat ride away. The border town on the coast is not only increasingly popular as a gateway to Cambodia for overland travellers, but also as a destination itself. With its many pristine rivers, dense mangrove forests, virtually undiscovered Koh Kong island and the nearby jungle-coverd Cardamom Mountains, Koh Kong province offers a wealth of eco-tourism and adventure possibilities. Local Adventures was founded in 2003 and is based in Phnom Penh, Cambodia. As a firmly established and trusted travel company we specialise in tailor-made quality trips and tours to every corner of the Kingdom. With our long-standing experience, our commitment to quality as well as our wealth of local knowledge we want travellers to have as many authentic experiences as possible and help them discover the true Cambodia. We work closely with a growing number of travel companies and customers from the Netherlands, Belgium, Denmark, Germany, Switzerland and many other countries. The one thing they have in common is that they value our high standard of individualised service, reliability and innovative travel ideas as well our enthusiasm and passion for our work. At Local Adventures we are strongly committed to quality and reliability. With our two branches in Phnom Penh and Siem Reap and our firmly established network of expert guides, staff and partners in most provinces we not only ensure a very high standard of personalised travel services but are also continually provided with the latest information and insider knowledge about every location. This competence also provides us with flexibility, an important precondition for perfect travel experiences in a country in which travel conditions can change rapidly. 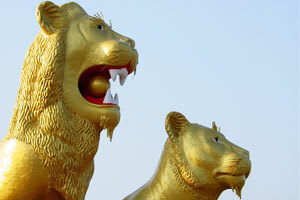 As Cambodia specialists we concentrate on what we know best – Cambodia.